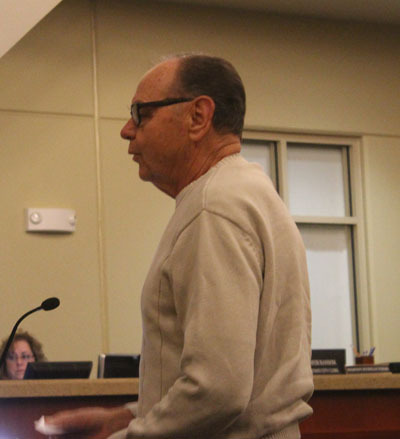 Andy Domenigoni, owner of the "Golden Triangle" property, addresses the Murrieta City Council Tuesday night. A project that has been tossed back and forth in the political arena for more than 25 years moved closer to reality Tuesday night with a unanimous vote of the Murrieta City Council to approve a development agreement with the owner of the so-called "Golden Triangle" property. 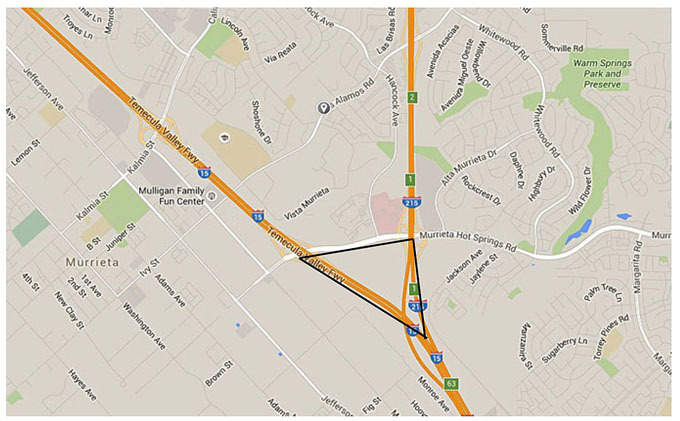 The Triangle -- a 64-acre piece of undeveloped land -- is at the confluence of Interstate 215 and Interstate 15 and bordered on the north by Murrieta Hot Springs Road. The property owner, Andy Domenigoni, represents one of the pioneer families of the area. He has negotiated first with Riverside County and then the City of Murrieta since 1990. At its outset, the project was planned as the Murrieta Springs Mall -- a sprawling complex with shops and restaurants that would generate millions in tax revenue for the city. For more than two decades, however, it has been caught up in disputes over various aspects of the project. Those points of conflict -- reportedly including a request by the city for a $1 million fire engine to service the area, hundreds of thousands in fees to the city for parks, and other "public benefits" to the city -- led to legal action taken by Domenigoni against the city. In 2013, Domenigoni re-entitled the Murrieta Springs Mall and presented it to the city as what he calls a "more business friendly, open air mall." 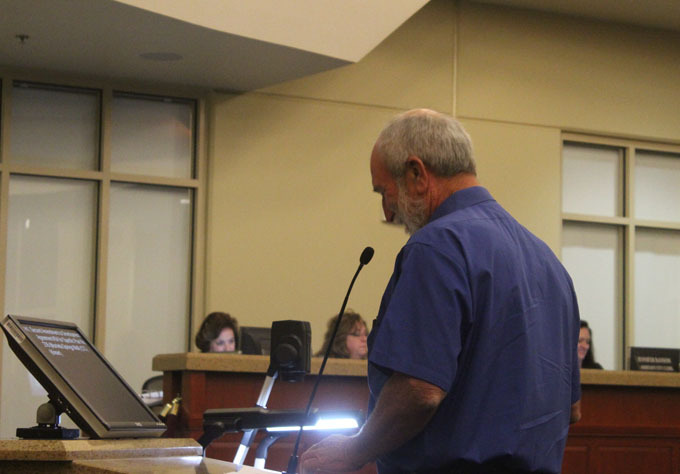 Photo at right: Resident Max Miller speaks out in favor of the project. Since then, negotiations have continued without a development agreement satisfactory to both sides. Residents attended Tuesday night's City Council meeting prepared to argue for approval. In the end, they had only to thank council members for a quick motion to approve the agreement. Mayor pro tem Rick Gibbs' motion to approve went against the recommendation of city staff, which asked the council to deny the latest agreement proposal. After public comments were taken and Domenigoni was given a chance to speak, approval of the agreement passed unanimously. "I realize the city is not going to get what it was hoping to get from Mr. Domenigoni," Gibbs said. "It's time to move forward. I move approval of the agreement." Domenigoni said there are no specific plans for the project other than the outdoor mall theme, although a hotel, restaurants and a theater have been discussed in the past. He plans to bring in a partner in the development process. All agreed that despite past differences, the agreement would be a tremendous benefit to the city. "I appreciate Mr. Domenigoni sticking with this," Mayor Randon Lane said. "Others might have walked away. I think what we'll have is the most pristine project in Southern California." Many hurdles must still be cleared, including development of plans, their approval and a permitting process with several agencies. Even so, there was an air of optimism as the meeting drew to a close. "As Mr. Domenigoni said, we haven't always seen eye to eye on this," said council member Alan Long. "But we need to continue to strive to do a better job of looking at these projects from the viewpoint of the developer." Domenigoni was poised to argue his position, but found little need to do so when asked to present his case during the public hearing. "We've been at an impasse for almost two years," he said. "I've always been willing to say we will negotiate in good faith." Domenigoni said that during the negotiations, he dropped requests for gas stations and drive-thrus that the city opposed. "I'm not asking for any of those things back," he said. "As far as the public benefits, a judge said the city has no leg to stand on. We've spent $2.5 million out of our own pockets to re-entitle this project. To my knowledge, the city has spent zero. "I could refute a lot of things the staff did wrong. I was going to say a lot more. But it's time to move forward. The tax dollars generated from this project will help the city immensely."